The French love beautiful things almost as much as they think all Americans love kale. And of course, they love their cheese. It only makes sense, then, that they put a great deal of thought into how they cut the cheese -- and we're not talking about crop-dusting coworkers. Cheese slicing is actually a much more particular process than you'd imagine, so we had a real-life French dude explain the rules and regulations regarding one of the most sacred foodstuffs in traditional French cuisine: the cheese course. The reasoning behind the process is two-fold; it ensures that everyone getting in on the plate o’ fromage gets an even piece, both in size and amount of rind, and that the picked-at platter remains as handsome as it was before all the carving and serving. One knife per individual cheese! 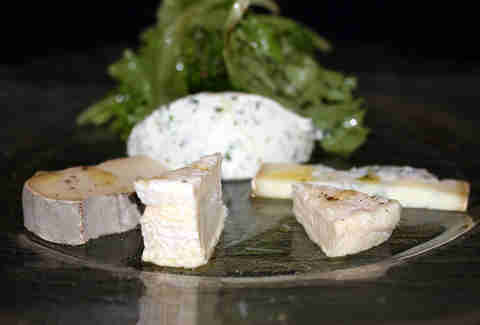 You can’t have that Brie creaming all over the Comte and mingling flavors. Each hunk of delectable dairy goodness must be coddled, and not all knives are created equal. 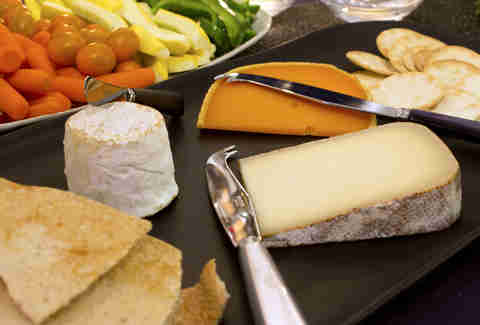 Slicers and other fromage flatware come in a myriad of styles and sizes, each intended for a specific texture of cheese, and some come with a forked tip, which can be used to move the cheese once it has been properly cut. It's not just for decoration. The thin stretched wire and sturdy handle will carve thick, even cuts through cheeses like Emmental, Raclette, and Morbier with ease. Knives with holes are preferable for Roquefort and other blue cheeses. The smaller surface area prevents the blue veins from sticking to the knife, which maintains the structural integrity of the slice. This is paramount. The evenly spaced vertical indentations on this kind of blade will keep creamy Brie, Camembert, or Mont d’Or from sticking. 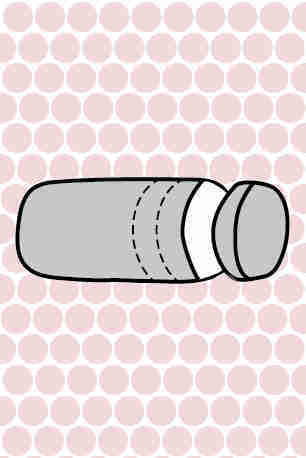 Slide the tip in first (yup) and push down with force. 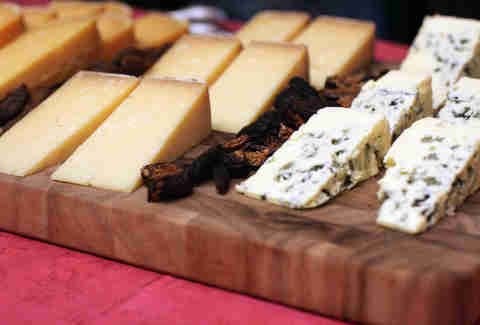 Harder cheeses like Gruyere, Cantal, or Beaufort will sometimes crumble into larger chunks under the pressure. You may crumble, too, from the stress of knowing which blades match which cheeses. 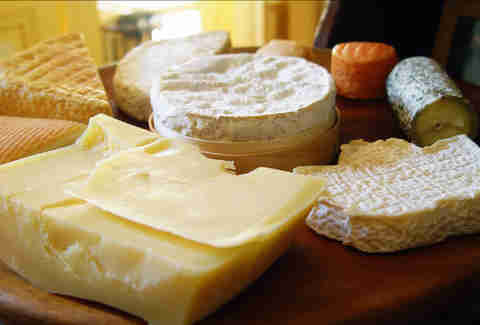 Some cheeses come entirely encased in a rind, like Brie or a big ol' wheel of goat cheese. Your guests, being cultured turophiles (that's a cheese connoisseur, if you're the uninitiated), will like to see how ripe the whey inside that rind is, and you will show them by cutting the “l’entame”, which is the first slice. And no digging out the gooey middle of the Brie, you American barbarian. It’s customary to eat the rind of soft and blue cheeses. All of it. 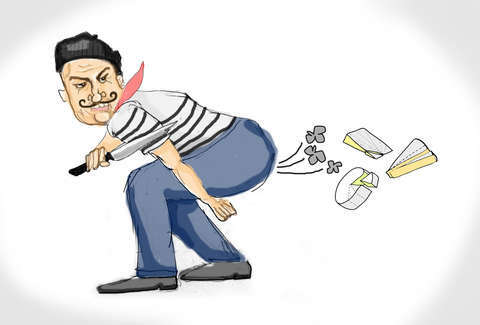 However, our Frenchman notes that you can feel free to remove the rind of the harder cheeses before eating. No need to always rind it out. With cutlery chosen and rinds in line, the next thing to consider is the shape of your cheese. 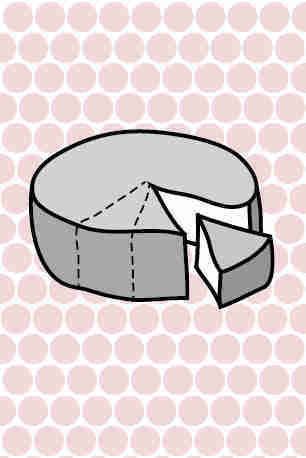 Cut small disks, wheels, pyramids, or squares, like Camembert or Crottins, like a cake. 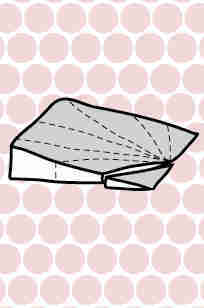 Intersect the middle in even-wedged, triangular slices. Same goes for atypical shapes, like the heart-shaped Neufchatel. Cut logs and block cheeses in even, cross-sectioned slices down the length of the cheese. 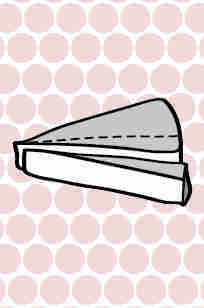 Cleave wedges of soft to semi-soft cheeses into thin slices along the long edge, radiating out from the tip. 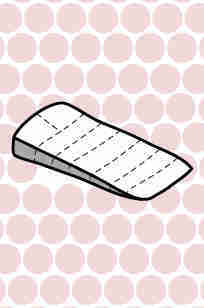 Cut wedges of semi-firm to hard cheeses width-wise until the last strip, which is then halved. Cut wedges of blue cheese out from the center on a bias. Now that you have successfully cut the cheese, it is important to distribute your slice on the flavor vehicle of choice. You can do better than just a Triscuit. Invest in some good French bread. Enjoy it straight up, on a roll. Spreading the cheese, however, is a big faux pas. As French epicure and gastronome Jean-Anthelme Brillat-Savarin said, “A dessert without cheese is a beauty who misses an eye”. And as we say, “Cheese cut incorrectly is still delicious". Carrie Dennis is a writer for Thrillist Media Group and won't hesitate to break all the rules when it comes to eating Camembert. Follow her to all kinds of other cheese on Twitter @CarrrieDennnis.